What I have in front of me today is another well put together TV movie, similar in quality to ‘My Boy Jack’. And just as with ‘My Boy Jack’ the BBC, in their infinite majesty, have had a hand in its production. My British heart swells with patriotic pride that dear old Aunty is still capable of knocking out these quality one offs pretty much whenever they set their minds to it. There is a solid cast too. 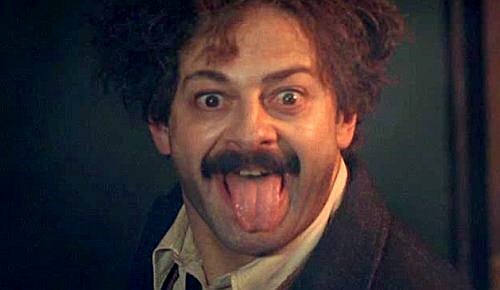 There’s Andy Serkis playing Albert Einstein in his 2nd Great War Film review in a row following on from my previous review for the dreadful ‘Deathwatch’. For the record he stole the show in ‘Deathwatch’ playing a murderous nut job, his role today also has plenty of nut job but much less of the murderousness. We also have David Tennant (who was still also the Doctor from Doctor Who at the time) playing British scientist Arthur Stanley Eddington. 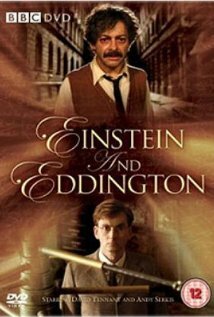 On the face of it ‘Einstein and Eddington’ doesn’t have much to do with the Great War other than being chronologically set within the era. At least that’s what I thought before watching it. Having now come out the other side of that particular journey I am much more enlightened. This isn’t just the story of Albert Einstein and his rise from obscure eccentric scientist to celebrity eccentric scientist but is, more importantly, also the story of how the scientists of the Great War era were utilised for the war effort whether through nationalist pride or state coercion. The film has several threads of storylines that are well entwined with the Great War as the backdrop. We follow Eddington as he struggles to get the British scientists of the day to accept that maybe Isaac Newton didn’t have his model of the Universe quite right. We have the story of the ascent of Einstein from unknown to global celebrity. There’s also the story of the moral dilemma with the scientific community in Germany due to the use of German scientists in the war effort for the invention and production of poison gas and explosives. Eddington also struggles with his religion, his homosexuality and his pacifist stance throughout the film. Basically there’s a lot going on. Having said that it never feels overly busy. I’m not sure on the historical accuracy but it feels straight up enough for me and how could I doubt the BBC. The pace is good and the length is the stock standard, BBC friendly, TV Movie 89 minutes. But as I said they pack a lot into that time. It flits between the two main stories of the titular characters as they cope with the different issues the Great War has thrown up for them and also as they begin, in the second half of the film, to correspond with each other. It’s a good little number and manages to tug at the heart strings on occasions with Tennant playing Eddington’s pacifist stoicism in the face of a baying crowd very well. Serkis too does a good job of showing Einstein’s mental and physical downturn as a direct result of his moral dilemma at the hands of his wealthy, war mongering (Krupp?) benefactors. The finale, where the two great scientists finally meet is downplayed a little and maybe fails slightly to provide a high-note crescendo ending to the whole film but that really is a bit of nit-picking on my behalf. 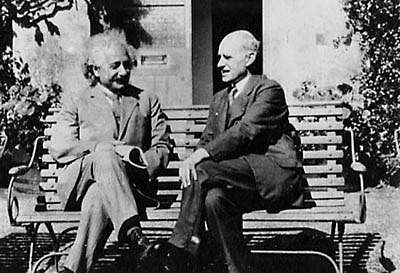 I liked Einstein and Eddington. It’s TV Movie simplicity and BBC quality means there’s not much to dislike. Whether or not it’s a detailed historical or biographical document is for someone more knowledgeable in these things to judge. As ever, I’m more concerned with the quality of the story and its respect for the subject matter. I can confirm that both of those are firmly in place and intact. Good job BBC, I love you. Clicky Clicky to buy. I heartily recommend it.